My earliest memories are of the natural world. I remember finding a group of Eastern tiger salamanders beneath a board in a park near my suburban Chicago home well before my 5th birthday, observing wildlife on family trips to the great western states – a black bear across a pond in the Tetons, a moose that seemed as large as a house in Utah, and herds of elk and bison in Yellowstone that seemed to reach to the horizon. My parents will tell you that my obsession began even before that, as even before I could walk I explored every leaf, crawling thing, and speck of dirt that I encountered while crawling on all fours. My career in biology began early, as I would get calls as a child to remove snakes on my neighbors’ property. I fell in love with reptiles and amphibians, then insects, then mammals, then birds, then plants. This love and passion for the natural world led to a relentless, often obsessive pursuit that has only intensified with age. As the old adage goes, the more I learn, the more I realize how little I really know. I studied wildlife ecology in college, and went on to pursue a Master’s investigating various aspects of the avian communities of Iguazu National Park, Argentina. There I met my wife, who shares my love (though perhaps not my obsession) for nature. She soon became my eyes and ears, as I realized she was much more adept at spotting irregularities on the landscape than I. Since she has become a partner on my quest to experience as much of the world’s biodiversity as possible in our short time here. Several years ago I began taking a camera along on my outdoor adventures. Over time I refined my craft and upgraded my equipment until photography became as much an obsession as nature. To me the two became interlocked forming something of a super passion. As time went on, my pursuits changed from ambling through interesting places to see what I can see to specifically targeting certain species that I wanted to experience in their natural setting. After several years of pursuing targets species, this concept came to me. 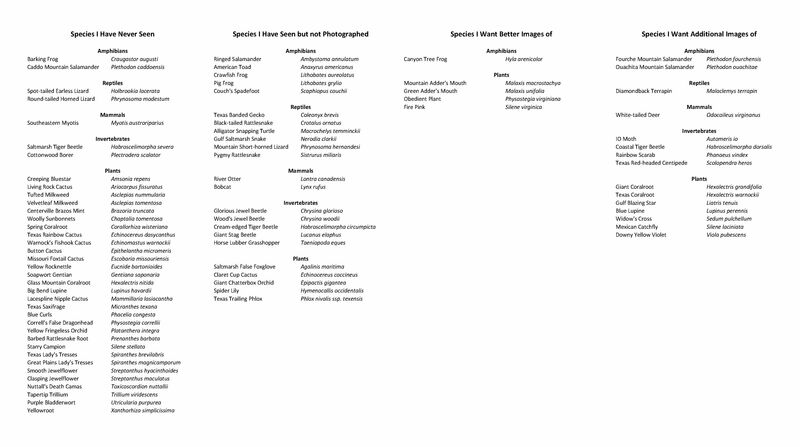 A project of sorts where I establish a list of species that I want to see throughout the year, and documenting my pursuit of each of them. So I started this blog, to share my adventures, experiences, and photos with any interested party. Below you will find my list of species I hope to find in 2017. Some are rare, some common. Some will be difficult to track down, some easy. Along the way I expect to find many other species of interest which I will also share here. Click on the list below to see a larger version, and stay tuned throughout the year for the adventures to come. This entry was posted in 2017 Biodiversity Goals. Bookmark the permalink. Do you have cougars in the Pineywoods? Historically yes. Occasionally sightings or evidence pop up of one, but they are hard to verify. If there are any roaming East Texas now they are almost certainly lone males seeking new territories.